WrestleMania 35: Kofi Kingston Vs. Daniel Bryan (WWE Title Match) - Wrestling Inc.
We go to the ring and out first comes The New Day - Kofi Kingston with Big E and Xavier Woods. Big E has a large gift for Kofi that he's keeping at ringside for now. Fans chant for Kofi as the music stops. Out next comes WWE Champion Daniel Bryan with Rowan. We get formal ring introductions from Hamilton. They lock up and go to the mat real quick to start. They break and fans chant "KofiMania" now. They lock up and Kofi takes them down this time but Bryan gets the upperhand. More back and forth in the middle of the ring. Kofi with a big dropkick. Kofi runs the ropes and leaps out, taking Bryan down on the floor. We see a large group of Superstars backstage in the locker room, cheering Kofi on. Bryan regroups with Rowan on the floor as the referee counts. Bryan returns to the ring and Kofi grabs him in the corner. Bryan reverses it and rocks Kofi with strikes and a big uppercut. Fans rally for Kofi now. Bryan grabs a Kofi kick in mid-air and takes him down. Bryan with the surfboard submission in the middle of the ring. Kofi breaks free and unloads in the corner. They run the ropes and Kofi leaps for a big double stomp and a pin attempt. Bryan wrestles Kofi on the mat now as they continue to keep the pace kind of slow. Woods, Big E and Rowan watch from ringside. Kofi counters a suplex and nails a big flying clothesline. Kofi gets hyped up and hits the Boom Drop in the middle of the ring. Kofi baseball slides Bryan from the mat under the bottom rope to the floor. Kofi springboard and leaps from the ring but misses and lands hard on the edge of the announce table as Bryan moves. The referee counts as Bryan gets up first. Bryan brings it back into the ring and works Kofi over while talking trash. Bryan drops Kofi over the top rope and keeps the offense going. Bryan goes up and leaps with a knee to the back while Kofi is draped over the top rope. Bryan with a close 2 count. Bryan grounds Kofi and we see the locker room cheering Kofi on again. Bryan rolls Kofi from pin attempt to pin attempt on the mat. Big E and Woods cheer Kofi on from the apron. Kofi unloads with back elbows into the corner. Bryan goes on and nails a big flying dropkick in the corner. Bryan with another running dropkick to the face. Bryan charges again but Kofi leaps with the stomp. Kofi tries to follow-up but Bryan immediately applies a half-Boston Crab. Kofi finally makes it to the bottom rope and the hold is broken. Bryan ends up taking Kofi to the top but Kofi knocks him to the mat twice. Bryan climbs up again but fans chant "yes!" as Kofi's back elbows rock Bryan, eventually knocking him to the mat. Kofi re-positions and leaps with a splash to the back. Kofi with a close 2 count. We see Superstars taking it all in backstage again. Bryan and Kofi get up to trade big shots in the middle of the ring now. Fans go along with them. They unload on each other faster now. Kofi counters and goes for the Trouble In Paradise but it's turned into a Crab but that is also countered. Bryan blocks off the SOS and elbows Kofi in the mat. More back and forth out of the corner. Bryan applies the LeBell Lock but Kofi struggles to avoid it, kicking Bryan in the head. We see Superstars chanting and clapping for Kofi in the back now. Bryan shuts down Kofi's stomp and his momentum in the corner. Bryan taunts Kofi from the corner as fans chant "no!" instead. Bryan charges to put him away but Kofi turns that into a 2 count. Kofi drops Bryan with the SOS next but Bryan turns it into the LeBell Lock in the middle of the ring. Bryan unloads with elbows to Kofi and re-positions the Lock. Kofi finally breaks the hold with his foot on the bottom rope as fans pop for him. Fans chant for Kofi. Bryan delivers kicks while Kofi is on his knees now. 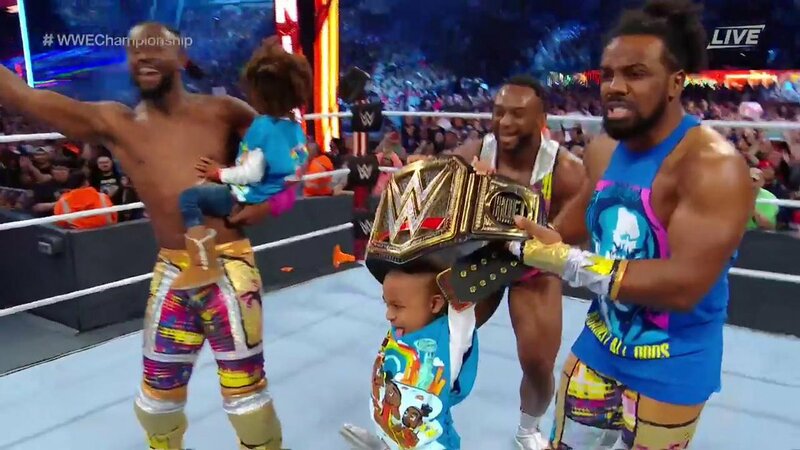 The New Day cheers Kofi on. Kofi gets up and dares Bryan to bring it again. Fans go wild. Bryan fights back as they go at it. Kofi counters and catches Bryan, dropping him on his face for a close 2 count. Bryan rolls to the floor to regroup with Rowan. Kofi approaches but Rowan stands there. Woods runs over but Rowan sends him over the announce table. Big E comes over next but he gets dropped. Kofi with a Trouble In Paradise to Rowan. Big E scoops Rowan for the Midnight Hour on the floor as Woods leaps off the announce table with the assist. Bryan runs to the ropes but Kofi catches him at the ropes at the apron. Kofi enters the ring as everyone cheers him on. Bryan avoids Trouble In Paradise and delivers the big knee. Kofi still somehow kicks out at 2. The locker room pops big we see in the back. Bryan grabs Kofi by the arms and delivers stomps to him as Woods and Big E cheer him on. More back and forth now as he can't put him away. Bryan goes for the LeBell Lock again. Kofi slides out of a move and mounts Bryan with strikes. Kofi holds Bryan by his arms now while delivering stomps. The fans chant "yes!" as he stomps. Kofi stands tall and plays to the crowd as they start the "New Day rocks" chants. Bryan gets up and Kofi drops him with Trouble In Paradise for the pin to win.